Thank you for posting the notices. I looked at them earlier today, and read them aloud to my hubby. I couldn't get through them so he ended up reading them to me. What really shines through is how close the family were, and I'm grateful to them for calling him by his (private) pet names in our presence. A public memorial service for Australian star Heath Ledger will be held next week in Los Angeles, Australia's foreign minister has said. Stephen Smith added the actor's family would be offered help to return his body to Perth in Australia, where he is expected to be laid to rest. Ledger's publicist said funeral arrangements "would continue to be kept private at the family's request". The 28-year-old was found dead in his New York flat on Tuesday. Mr Smith also told reporters on a visit to the United Nations in New York that he understood that a private family memorial service had taken place in the city. He gave no details of the proposed memorial in Los Angeles, and said any tributes in Australia would be determined by Ledger's family. The actor's body was moved from a funeral home on Friday amid a crowd of reporters and photographers. A private viewing of Ledger's body had been scheduled at Frank E Campbell funeral home in Manhattan earlier in the day, which was barricaded by police. In death notices published in The West Australian newspaper, the Brokeback Mountain star's family remembered him as an "old soul". "You dreamed your dreams and lived them with passion and intelligent commitment," it said. In a separate tribute, his sister Kate said that the pair were "ultimate soulmates", adding she viewed him as "just my little brother". "We have been privileged to accompany you on a ride through life that has simply been amazing and through it all we have loved each other beyond imagination. Our hearts are broken," the death notice read. In an additional tribute, Ledger's father Kim wrote: "Heatho, Beef, my beautiful boy, so loving, so talented, so independent ... so no more chess games mate ... this is it, couldn't beat you anyway. We were one, in soul and commitment, just father and son." Meanwhile, the makers of Ledger's most recent film have suspended production. The star had recently completed filming in London on The Imaginarium of Doctor Parnassus, directed by Terry Gilliam. The $30m (£15.1m) production had moved to Vancouver, Canada for interior and bluescreen scenes. The film's makers issued a statement saying: "Terry and the producers will be assessing how best to proceed." The producers also paid tribute to the 28-year-old, calling him "a great actor, a great friend and a great spirit. We are still in a state of deep shock, saddened and numb with grief". A post mortem carried out on Ledger was inconclusive, with results from further tests expected to take more than a week. I appreciate articles concerning the security firms, you guys. I'd been going 'WTF?' over the phone call thing all week, and this gives a little more clarity . . .
Me too. I was glad to find the one I posted and Meryl's was interesting, too. I just posted this over on the "Tributes and Obits" thread, but I'll ask the question here, too, since it's kind of newsy. Does anybody know whether Annie Proulx has issued a statement? I clicked on some random news article this morning and the featured picture was 'the crate' being loaded into a hearse. I could have done without seeing that and in fact, wish I hadn't. I know Heath is not inside of that crate, but it really hit home how final it really is. I sympathize with the family's very long journey back to Australia as they accompany Heath's body. AS the world mourns the loss of the prodigious talent of Heath Ledger, attention has turned to the sorrow of his former partner, Michelle Ingrid Williams. Ledger's most challenging and rewarding role was that of family man and there are fears that the loss of his greatest love may have prompted the anxiety and insomnia that could well have cost his life. The split in September with his then-fiancee and mother of his beloved daughter, Matilda, came as a shock to many. The couple, whose love story had played out publicly - both as co-stars on the set of Brokeback Mountain, then in a world tour promoting the film - had seemed perfectly matched. Indeed Ledger, a wildly successful performer who clearly never wanted to be a celebrity, had been unusually forthcoming in interviews about his feelings for 27-year-old Williams. "The level of synchronicity that's in my life now, with me and Michelle and now Matilda, has meant it's become everything to me - the most important thing I do,'' he once said, of family life. "My child smiles up at me in the morning and that's it - I feel connected to life, this is what it's all about. Ledger said he and Williams, a former child star who made her name in the soap series Dawson's Creek, had fallen for each other almost as soon as shooting started on Brokeback Mountain, in Canada. "We were knee-deep in snow and on the fifth take, Michelle and I were tobogganing down the hill _ we were supposed to fall off, having a fun time,'' he said. The romance was so swift that Williams was pregnant before the shooting finished and had given birth to Matilda before the film's release. "Becoming a father definitely exceeds all my expectations, but I was always expecting it and a lot from it. It's marvellous - and the most remarkable experience I've ever had,'' Ledger said. 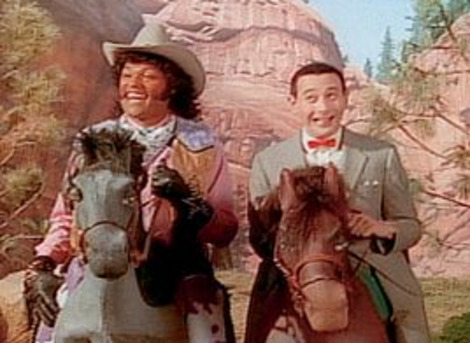 Friends and co-stars reflected last week on the powerful bond that the pair had shared. Screenwriter Luke Davies, whose film Candy was the first shoot Ledger took part in after Brokeback Mountain, wrote of their obvious bond during a night in Sydney. "He seemed, at times, quite literally beside himself with love for her, unable to contain his excitement,'' Davies wrote last week. "I remember one night during pre-production, in an almost empty nightclub in Kings Cross, watching him sweep her to her feet and swirl her around an empty dance floor, much to the relief of a bored DJ. "It was a completely private moment - he wasn't doing it for the benefit of others, those of us settling into our seats or buying a round. "He wanted to dance with Williams. He seemed to carry that same I-can't-believe-it-can-feel-like-this grin from 10 Things I Hate About You. Williams was not just his lover - she became his defender, after a nasty run-in with paparazzi photographers spurred the pair to move out of their Bronte home, in search of privacy in New York City. The young star who, like Ledger, was nominated for an Oscar for her performance in Brokeback Mountain, had the grief of his death etched across her face in grainy photographs taken a day after her former partner's shock death. Williams had been in Trollhattan, Sweden, where she had been shooting scenes for the upcoming film Mammoth, when she was told. It is not known why their love story fell apart. Neither has spoken about it publicly. Even in a world of cynical movie-star romances, their relationship seemed special. Those moments on the red carpet, when they looked at one another and smiled, seemed to have extra intensity. But like so many relationships in the glare of public life, it just simply crumbled. At the time of the separation, there was no official statement - just confirmation of the break-up from a "source'' to a US tabloid magazine. Saying the relationship had been troubled for some time, the "friend'' said the pair had simply grown apart. Ledger moved out of the Brooklyn townhouse that he and Williams shared, into the SoHo, Manhattan, apartment where he was to die. He still spent time with his daughter, but filled his other hours with long periods of socialising and a frenetic work schedule. Since Ledger's death, reports have emerged of a complicated web of relationships with a series of glamorous women. The number and beauty of these women is not unlike those who played a role in Michael Hutchence's life before his untimely death in Sydney in November, 1997. Hutchence's partner, Paula Yates, never recovered from his death and died of an accidental heroin overdose at the age of 40, in September, 2000. The death of Yates left their daughter, Heavenly Hiraani Tiger Lily Hutchence, an orphan. Much younger than Yates, Williams must now confront her own grief, the public outpouring for her ex-fiance - and the women who filled his days in her absence. It is a lot to ask of a 27-year-old single mother. Ledger's close-knit family, devastated over his death, has promised to keep looking out for the little girl whom he loved so much. Let's hope there is as much consideration for Williams. Did Heath Ledger finish vocals on 'Dark Knight'? While the late Heath Ledger's family and friends tend to the sad details of his burial this weekend, a debate is ripping through Internet fan sites about what will stand as Ledger's last completed film, Batman: The Dark Knight (due to open on July 17th). The burning question is, how complete was Ledger's post-production work on the maniacal character of the Joker? On Jan. 25th, E! Online gossip columnist Ted Casablanca posted an item quoting a "studio insider" saying that Ledger had done "zero" post-production looping on the movie. (Typically, an actor re-records many lines for a film long after principal photography wraps, in a process called "automated dialogue replacement," or ADR. It's an especially extensive process when many shots have been filmed on location, since all kinds of incidental noise can interfere with the dialogue's clarity and can require up to three-quarters of the lines to be re-performed on a dubbing stage, with the actor looking up at the film images and matching his or her own mouth movements.) But Ledger's vocals are perfectly clear in the bits of footage so far released—trailers and a prologue bank-robbery sequence shown with IMAX prints of I Am Legend. Fan websites like Ain't-It-Cool-News, Superherohype.com and Batman-on-Film.com are full of assertions contrary to the Casablanca report, saying that in fact Ledger was done with all significant looping. Ledger himself, while promoting the Todd Haynes film I'm Not There last fall, had said he was finished with his work on Dark Knight. Dark Knight director Chris Nolan and execs at Warner Bros., the studio releasing the film, were not available for comment, and have not issued any public statements about the status of the movie. EW placed a call to Oscar-winning sound designer and sound editor Richard King, who's handling the Dark Knight audio work, but he declined to comment. According to several other sound-mixing experts who also declined to speak on the record, there's no way to tell what the situation is with Dark Knight from the outside, since the amount of ADR required, and the timetable for doing it, varies wildly between films. (In plenty of instances, looping is not completed until very close to the final release date, perhaps as little as a month or two out.) Ledger had been working in London on Terry Gilliam's film The Imaginarium of Doctor Parnassus, which meant he was close to Dark Knight director Chris Nolan's home turf and might well have been available if needed. 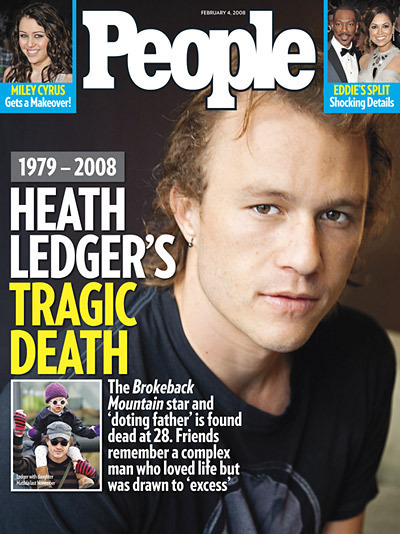 As surmised in my earlier post, People magazine will be the only celebrity weekly to have a cover featuring actor Heath Ledger, whose death was discovered late yesterday afternoon — too late to feature on other celebrity weekly covers, whose editions closed on Monday night and which will now be on newsstands all week without mention of the sad news. Nat Ives at AdAge has more details, as well as the cover image which we've reproduced here.